There’s always a time when you need to make a quick sketch of a garment for some reason. 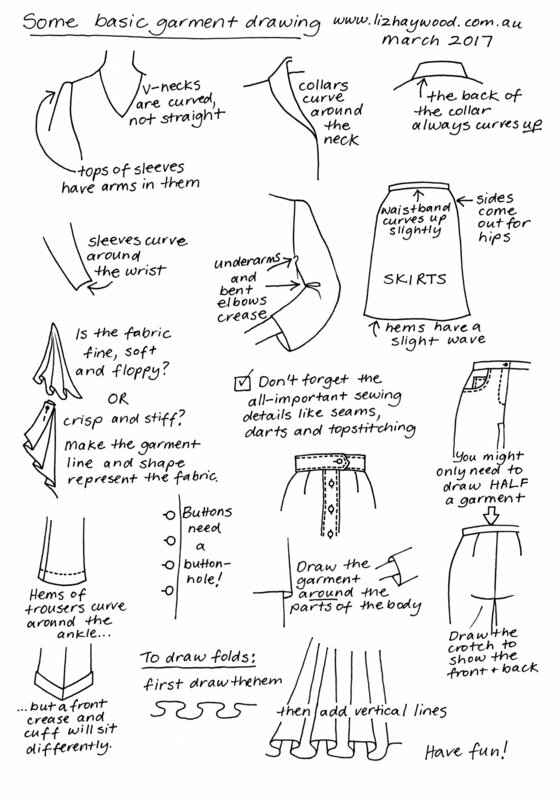 To draw it for a friend, record the style or plan a pattern. If you don’t draw often, it’s a hard thing to do. A traceable croqui is the answer. A croqui (pronounced crow-key) is a figure drawing used as a template for fashion illustration. To use a croqui, you slip it under a sheet of thin paper (or even tracing paper) and draw the fashion illustration over the top. 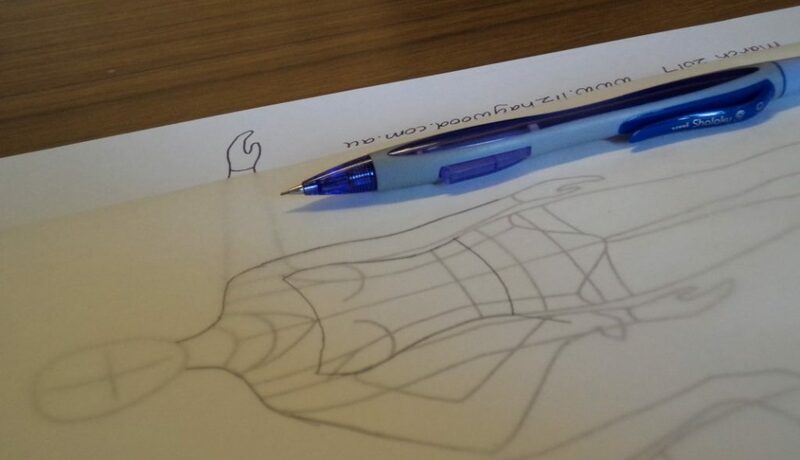 It helps you get the proportions right and concentrate on drawing the garment rather than the body. Fashion croquis are typically super-thin and extra tall with long, long legs. There are lots available on the Internet if you do a search. This one I’ve drawn is hopefully a bit closer to Ms Average rather than Ms Supermodel. I fancy the back view looks like Betty Grable! (from the waist down, that is). I admit I’m not terrific at fashion illustration. We did a module of illustration when I was a fashion student, and the key is to practise but I don’t much. I’ve always been hopeless at faces and not much better at hands. 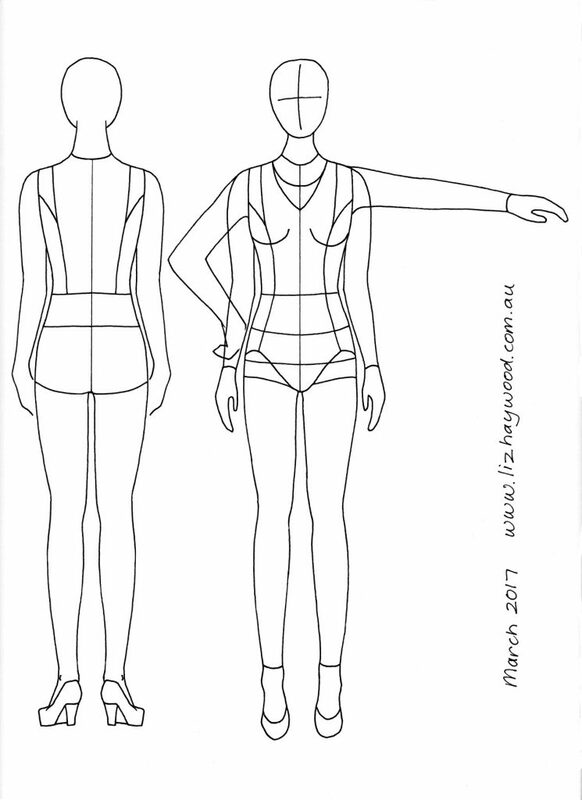 However, I’m half-reasonable at technical drawings of clothes, probably because patternmakers do little sketches all the time. An illustrator might have a selection of croquis in different poses so they can choose one to suit the garment. Mine just has a couple of different arm positions. An important thing to remember when drawing clothes is to curve your lines around the body. Our bodies are rounded and our clothes are worn around us. By the way, one doesn’t need to be able to draw to design clothes. There are plenty of fashion designers who can’t draw (I’ve worked for a few), even famous ones. Does that make you feel better? Sketching is only a means to communicate an idea. Instead, some designers collect photos, make mood boards, supply descriptions, or use existing garments or fabric to show their ideas. Some designers employ sketchers. Also, not all illustrators use croquis. Lots don’t -they’re so practised they just draw and get it right first time (sigh! ).